A further militarization in the Mediterranean has been approved through a resolution passed by the U.N. Security Council on Oct. 9. 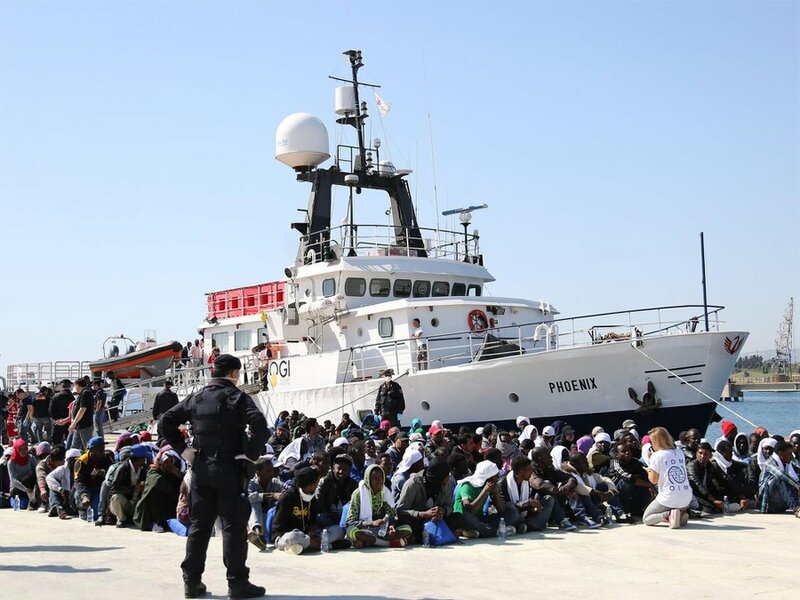 By a 14 to 1 vote, European Union naval forces were empowered to purportedly halt and turn back vessels transporting migrants across the Mediterranean into Southern Europe. Only the Bolivarian Republic of Venezuela abstained in the decision. Millions of people have been dislocated throughout Africa, the Middle East and Asia in the worst refugee crisis since the conclusion of World War II. This renewed effort, called “Operation Sophia,” consists of six naval warships from the EU in constant patrols off the coast of Libya. These vessels have been given the ability to halt, seize, detain and destroy boats used by human traffickers bringing thousands to Europe every week. A statement issued by the EU naval operation said, “Assets will conduct boarding, search, seizure and diversion, on the high seas, of vessels suspected of being used for human smuggling or trafficking.” (eeas.europa.eu) One Italian aircraft carrier, a French frigate and another from Britain, along with a Spanish ship and two German ones will be spearheading the mission, which follows the same pattern as the EU anti-piracy expeditions off the Horn of Africa. The migrant crisis has deeply divided the imperialist-led EU member-states, prompting the leaders of France and Germany to issue a joint statement calling for unity. Other countries such as Hungary have erected fences to keep migrants out of their territory, while abusing those who have entered by forcing them into detention centers and by beating and gassing seniors, men, women and children. European states were hit hard by the world capitalist crisis of 2007-09. High rates of unemployment and poverty increased even in relatively wealthier countries such as France, Germany and Britain. Racial tensions between oppressed communities and governments in these states have intensified over the last decade. Nonetheless, the leading economies in Europe recognize that unless they present a more liberal posture toward the international community, it will prove even more difficult to assert their right to maintain their military presence in Africa, the Middle East and Asia. While Germany and France frame their response to the migrant and refugee crisis — which is in actuality designed to continue their neocolonialist role — as a “humanitarian mission,” the Europeans are attempting to defuse a potential calamity or rupture within the EU structures. The inter-imperialist rivalry between the EU member-states and the U.S. and Canada necessitates fomenting the illusion of unity in relation to the migrant crisis. However, more recent members that were formerly socialist-oriented states in alliance with the Soviet Union, such as Hungary, are in a weaker position economically and politically, particularly in light of the right-wing political parties in power in several of these countries. Hundreds of thousands of migrants, many of them from Syria and other states throughout the Middle East, Asia and Africa, have presented a humanitarian and political crisis, with more than 3,000 killed so far in 2015. Images of floating bodies washing up on beaches are a profound symbol of failed imperialist policies over the last 13 years since the beginning of the wars in Afghanistan and later Iraq. The photographs and videos of migrants dying in the Mediterranean represent an extension of the invasions by Pentagon and NATO forces allied with their political surrogates in the impacted geopolitical regions. President Barack Obama’s administration is still attempting to justify its role in destroying large swaths of territory in the once stable and prosperous Middle Eastern state of Syria. The Russian Federation air campaign against armed opposition groups in Syria is a direct challenge to the imperialist wars of regime change that have characterized U.S. policy in the Middle East, Africa and Asia. Media reports indicate that more than $500 million in working people’s tax revenues has been wasted in a failed attempt to create a so-called “moderate anti-Syrian army.” After several years of effort, only five individual fighters have actually been able to remain within the framework established by the U.S. Despite these claims, there are obviously other groups fighting against the Syrian government that are fighting with U.S.-supplied arms. All that these other armed groups have been able to do is cause monumental death, destruction and displacement. Many people in the Middle East and around the world have welcomed the intervention of Moscow and Iran to defend the Syrian state. Divisions among the EU member-states will not shield even France and Germany from inevitable social unrest. Washington has announced that it will welcome anywhere from 10,000 to 100,000 Syrians into the U.S. — a completely inadequate number considering that it is the military and political policies of Washington and Wall Street that lie at the base of the crises in Syria, Central Asia, Libya, Yemen and Iraq. The migrant crisis is a direct result of U.S.-led imperialist militarism in various geopolitical regions as well as the ongoing world capitalist crisis. Turkey, a NATO state, is heavily involved in the destabilization of Syria, raising questions about the source of the bombing in Ankara on Oct. 10 that killed nearly 100 people. The only real promise of reversing the situation in the Mediterranean, the affected war-ravaged states on three continents, and the suffering of workers and oppressed in the imperialist countries due to the draining of national resources through war and destabilization efforts is to unite the peoples of these oppressed nations, along with the workers and oppressed in the industrialized states, in order to force the Pentagon, CIA and NATO forces out of the Middle East, Africa and Central Asia. Then the people of these regions will be able to resolve their own internal problems and bringing genuine peace and security.